Double kudos on Coop: The coaches not only found this kid, but are featuring him…nice move Ruff! Friends…apologies for virtually dropping off the grid the last three weeks…I assure you all that the horrid loss at UCF was not the reason for my absenteeism. Fourth quarter of the year has brought an unusually large amount of travel for me in my real (and much less interesting) day job. Blah, blah, blah…I know that I am singing to a choir here. Anyway, this game tomorrow, IMO, is going to give all of us a clearer picture of what our Pirates are all about and give us a good indicator into how the boys will likely finish the season. Navy’s record of late has been pretty darn good against opponents who are no worse than the ones we have beaten in the last two weeks. I think most of us were hopeful that we would come through the first four games of the season at 2-2 and the team did so. The loss to UCF was terrible, but we are still in the league hunt – particularly if Marshall puts it on Central Florida this weekend. A win against Navy will be a quality win and will legitimize that the team is actually improving, not just playing weaker opponents. There is a lot to be excited about going into the game…and a lot to worry about as well. With that in mind, here are some thoughts on that in the form of some questions, really. Is the Pirate offense getting good OR have our opponents just been that bad? 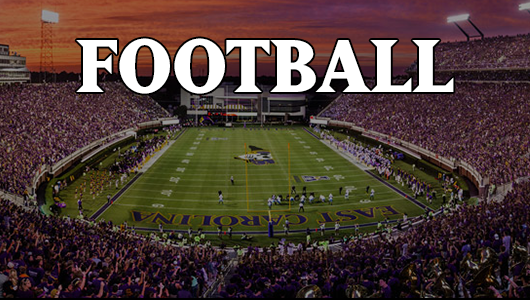 Analysis: Probably a little of both which bodes well for ECU. No doubt, Memphis and UAB do not bring the type of defense that UNC and UCF brought. However, 40+ points is still 40+ points. The striking difference in the last few weeks has been a much better mix of diversity in the play calling, vis-a-vis run/pass mix, involvement of a large number of receivers, and an offensive line that appears to be coming into its own…finally. The step down in competition certainly makes it easier, but my sense is that it is less the competition level and more the reps as a unit together that is helping to change the scoreboard activity. With Shane Carden more comfortable and with building rapport with his receivers, the passing game is emerging and with the offensive coaches allowing Vintavious Cooper to be the main back, the running game has flourished. With a nice blend of power and finesse in both the run game and pass game, defenses are playing on their heels more and I suspect that will continue to the end of the season. The OL is clearly more physical but better than that, in tighter sync with one another and that should carry over into a more physical game tomorrow against a higher level of competition. Is the passing game hitting on all cylinders now? Analysis: Yes…and no. Yes inasmuch as you can argue with 450+ yards of offense per game and 40+ points per game the last two weeks. Yes inasmuch as Carden has gone over the 300 yard passing mark and multi-touchdown passing game both weeks. Yes inasmuch as you can show that he is hitting no less than 9 different receivers, including some nifty tosses to the backs that have been highly effective. Carden is showing dramatic improvement in pocket awareness, pass progression acumen, and delivery of passes to the open guys. He will only get better. The concern is that aside from Justin Hardy – who is having a true all-league and possibly all -American season – none of the other wide receivers has stepped up to be that typical 2nd 1,000 yard threat in this air-based offense. They have been inconsistent in getting open, inconsistent in making big plays, and this needs to change. The OL has gotten better, but tomorrow will truly show if they are much improved or just had a pair of cupcakes. Is the Pirate run game legit or not? Analysis: Legit…but with an asterisk. While there is a strong case to be made that Michael Dobson had one of his most productive games as a Pirate againt UAB – and the kid did some serious damage with legs and hands alike – and while Coach Ruff is talking up Reggie Bullock’s return this weekend, the run game in this offense tracks back to three fundamental truths: 1) play calling and execution is noticeably improved; 2) the offensive line physical strength is there; and 3) biggest of all, Vintavious Cooper is a true feature back. Listen, if you ask me, Cooper earned the right to be a feature back 5 weeks ago, so it is no surprise that he has been so good. Go back and watch the games again. He is the only back we have that actually runs with his freakin’ head on a swivel. The OL has been getting a bad rap in my opinion…go watch the games my friends, there have been holes open ALL SEASON. But when your backs take the ball and run straight for the hole with blinders on, they get tackled by the first contact they encounter. Coooooop looks for the creases, makes a move, and turns 3 yards into 20. Yes, the run game is legitimate and this is a tremendous help to the passing game as well as gives us an opportunity to have longer drives; hence our defense can make use of the down time to prepare for the next series. If you want to see what his teammates think of him…just watch the enthusiasm with which his OL protects him, celebrates with him, and clears the way for him. Fun to witness. Can Shane Carden continue his effectiveness? Analysis: Yes. While quality of opponent helps make a QB look good, if you watch him, what you see is a QB that is growing into the system. More reps = better comfort and better comfort = better execution. Clearly, Shane Carden is improving with every snap and he is distributing the ball to a lot of receivers, meaning he at least knows his pass progressions and when given time, will find the open guy. More importantly, he is correcting some of the things he was not hitting on earlier. He is more aggressive in the pocket – not turning and running at first sign of pressure. He is showing more touch on his passes which has allowed the vertical game to emerge. And, he is a doing a great job of being a leader. He is actively running the offense now and his teammates are responding. Is our Pass Defense that Bad? Analysis: Ummm…sadly…yes. But it is correctable and able to be offset if the coaches choose to do so. The two things that stand out: 1) lack of pressure up front; 2) apparent lack of coverage awareness/skills in our sedondary and linebacking units. No doubt, with no pressure, even well-skilled secondary players are going to struggle to cover a guy for 7 seconds. Not feasible and to not have a single sack against the UAB OL is embarrassing really. So, how can a front so good against the run NOT get pressure on the QB. I hate to say it, but we simply don’t bring it often enough. I went back and re-watched the USC, UNC, UCF, and UAB games and it was startling how EFFECTIVE our blitzing was and equally starting how often we DIDN’T appear to blitz. Go down the list, Thompson, Renner, Bortles, and Brown…none are stellar QBs. But, they ripped us in the passing game. If you watch the film, you will see that when we chose to bring the blitz – almost without fail – each of these QBs broke down, made poor decisions – save maybe Bortles in the run game – and threw incompletions. So bad was our lack of blitzing in the UNC, UCF and now the UAB game that even the announcers were suggesting we bring someone. Now, I can’t blame the coaches for fear of a getting fried with our less-then-stellar DBs back there, but they are getting dusted ANYWAYS so why not up the ante a bit. IF WE don’t start to get more consistent pressure – meaning one play a series – Navy and Marshall will kill us in the air. IMO, we have the ability…just need the coaches to dial it up more often. On point 2, that is a little more tricky. I have opinions about certain players and their abilities to cover, but don’t really want to go there. HOWEVER, we have some guys who have the skills in the secondary who are getting beat and I wonder if there has been some issues in the secondary between the corners and the safeties in terms of Xs and Os and being on the same X or O at the same time. The long balls that have heard us this season make our corners look soooooo bad that I have to wonder if the safeties are not getting it done in coverage. Not sure…would love to hear opinions on this. Guys just appear too open…like, freeze the TV frame and there are no Pirates to be seen near the guy catching the ball. Unsettling for sure. Our second level guys still appear to be lost in coverage…neither looking around for receivers in their general area nor able to make any coverage effort on them when they are there. Not sure why, but it seems that we are uber vulnerable to the 10-15 yard pass between LBs and secondary – consistently. It kills us all-too-often. Interested to see how bad it hurts us with Navy. Generally when they throw on us, it has been highly effective. We need to ensure that their few passes don’t kill us on the scoreboard. So what does this mean for Navy? 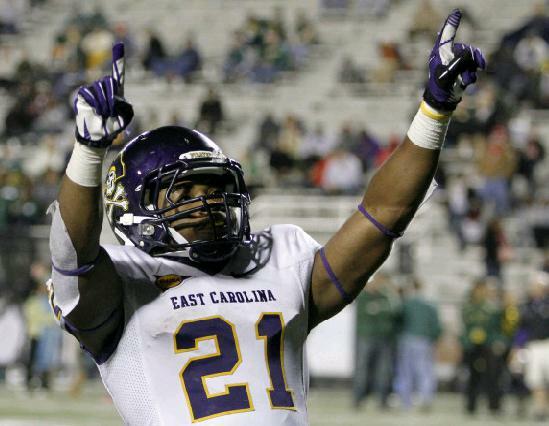 I think that Navy brings a good team to ECU that will execute its game plan well. It will be up to us on offense to keep things rolling, which I think we will. I think the O will have no problems moving the football and if we execute we will probably score enough points to win. Defending Navy…I think that is where the problems are going to lie. It will take everything our kids have to be disciplined to stop the triple option and because of that, I think that Navy could have an easy go of passing on us. And they will use it effectively to mitigate when we play the run well in sequence. For example, we may force them to a 3rd and five play – a play Navy loves because they can get it with the run so they know we will play the run in that situation – and ping…easy 8 yard completion and the drive continues OR worse, they pop a quick TD pass in as our secondary sells out for the run. Navy’s players will be where they are supposed to be and do what they are supposed to do every play…it is up to our guys to disrupt them…we have to have a play on every defensive sequence that disrupts or they will methodically roll on our defense. Yes, we will be bigger, stronger, and faster…but will our defensive scheme be appropriate and will that bigger, faster, stronger talent be used effectively…that is a huge question mark. Let’s face it, our D may be effective against the run, but just about every team we play is pushing the 400 yards or more total offense number and if Navy hits it, they will have the points to go along with it. I am hoping that we scheme this game right defensively and that our offense has gotten in two weeks worth of repetitions and is clicking. If the O is where they appear to be, then this one may be a track meet where the team with the ball last wins. Defense really needs to make a statement on Saturday. Well there are my thoughts friends. As always, please share your thoughts too.